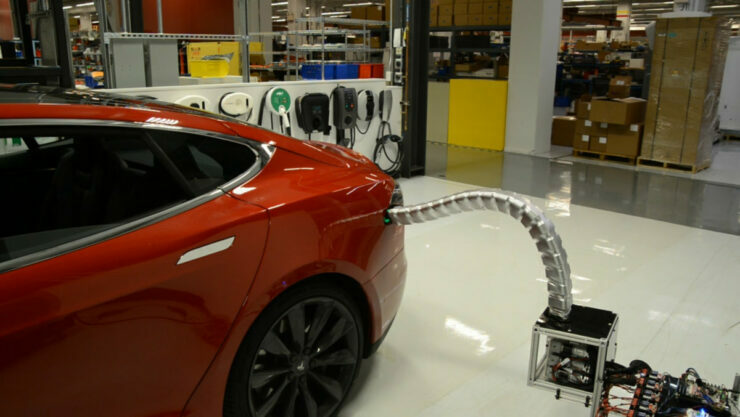 After much efforts to reduce the “forgot to plug in the car charger” issue, Tesla finally decided to come up with a solution by introducing a multi segmented robotic arm charger, this charger literally looks like a scary snake, which rises up as snake does and also slinks and glides like one towards the left side of the car where the charging port resides in the Tesla Model S. It also connects automatically without any human intervention required, however it is still under testing and this is just a prototype but in case this project flourishes the way it is expected to, charging you Tesla Model S will be less of a torture than before. This all is the brain child of Tesla CEO Elon Musk who hinted something like this a few months ago in a tweet. It’s really a hassle on an everyday basis to remember as soon as you come back to plug in the charger of your electric car since there are so many things on one’s mind when one comes back home tired. So the Tesla robotic charger will make sure that you don’t have to go through all the hassle of connecting the charger anymore and will probably be making your lives a hell lot easier. 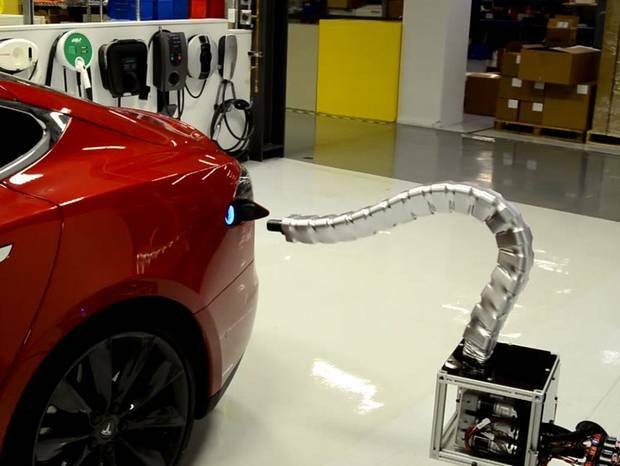 Tesla released a video regarding their new robotic charger this Thursday but didn’t give any more details as of yet, as it is still work in progress we will soon hear about the results and release of this charger. This robotic arm charger consists of 18 flexible segments. These look more like lamp on chromium plated steroids. This is fascinating that car charger port gets open due to car-charger communication. And soon after that the charger slides towards the port and fits itself into it within a matter of a few seconds. This will also make people less worried since plugging the charger by their own hands make them worry that they will get electrocuted. Although Tesla also allows the swapping of batteries, this still seems to be a better opt.